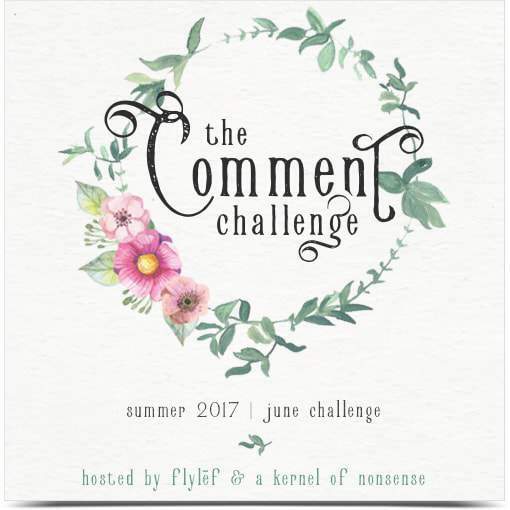 I am so happy to be participating again in the Summer Comment Challenge hosted by Lonna @ Flylef and Alicia @ A Kernel of Nonsense (Click links for sign up information ). I had so much fun doing the Winter 2016 Comment Challenge and I am looking forward to doing the Summer Comment Challenge for June 2017. It was great hooking up with new bloggers and spreading comment love. I’ve done a few of these challenges now and love how I can connect with someone new and make friends. It’s also an opportunity for me to check out all the interesting blogs out there! The challenge is a win-win situation for participants. I get to support bloggers by visiting their site – this not only helps in traffic but also the comments are great for search engine optimization. In return, my paired partner does the same for me. Win-win all around. I have committed to 5+ comments for the month of June, but hopefully will be able to do more than that. If you are interested in doing the Summer Comment Challenge which runs from June to August, head over Lonna’s and Alicia’s sites and check out the details for sign up. The more the merrier! I wonder who I will be paired up with? I am looking forward to the surprise! We love comments and getting to know our readers, so don’t be shy to say Hi, or let us know if something interests you. Want to talk about best books? What do you think about commenting on blogs? Do you like to comment? Let me know! Previous Post Top 5 Tips On How To Read More! Thank you so much for joining us again! I really hope you enjoy the challenge this June. Happy commenting! It’s fun to do the Comment Challenge and meet new bloggers. It’s nice to have someone with the same interest comment and it’s a great way to get to know the other person. I can’t find the information about your Summer Comment Challenge … I’m sure it’s just an age thing for me, but where do I find it? Lonna and Alicia are hosting the comment challenge so to sign up you have to head over to their website to sign up. The links to their site is at the top; click Flylef or A Kernel of Nonsense. I hope you’ll join, there’s still time! Adjective: suitable; well-adapted; pertinent; relevant; apt. 5 Books On My To Be Read: What Should I Read Next?